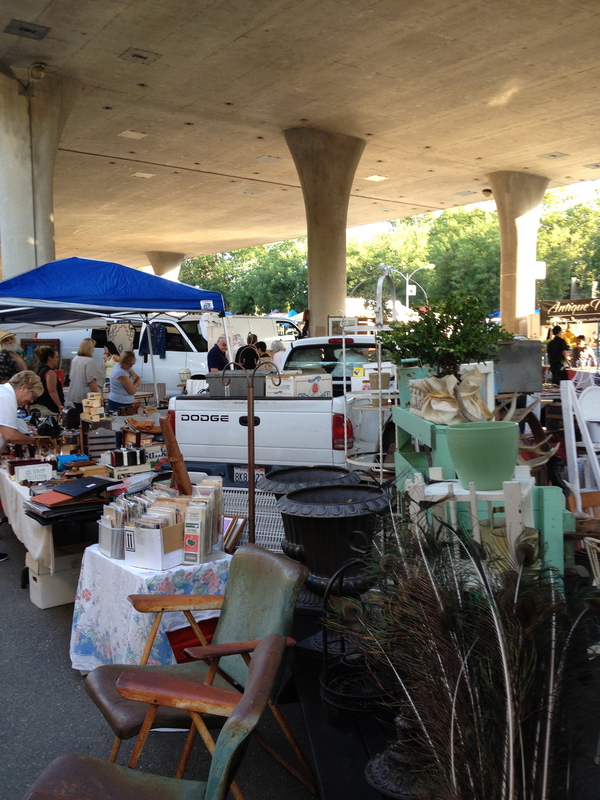 Sacramento’s Under-the-Freeway Antique Faire is one of the best positioned flea markets in California. It’s like being under a great concrete umbrella protected from rain or sun, as traffic goes whizzing by above. 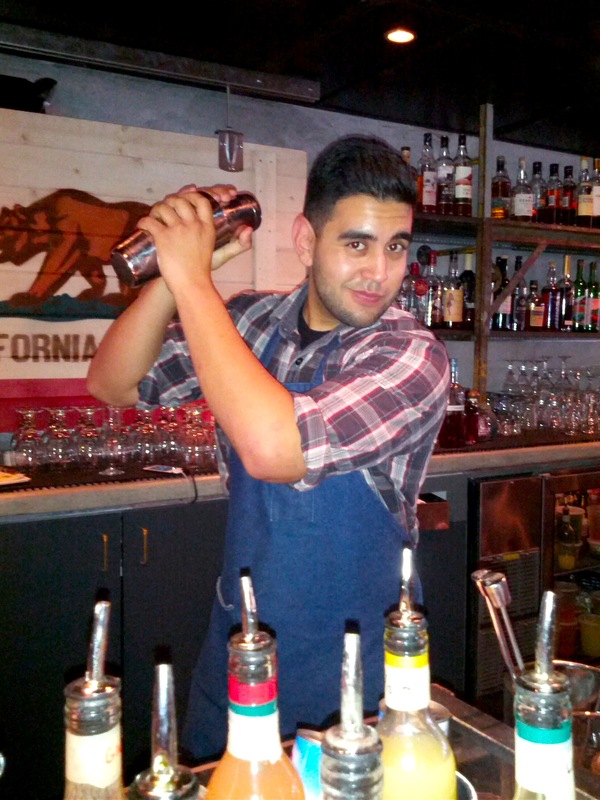 Sacramento is about a three and half hour drive from Carmel. If you’re not a Bay Area resident, you will not be aware of the toll lane in Benicia. I wasn’t. I’m from Vegas. We don’t have tolls, toll lanes or bridges. Thinking the left toll lane was like a commuter lane, I go flying by the traffic, thinking how cool is this. Needless to say, I get a ticket in the mail weeks later showing a photo of my license plate saying that I didn’t pay the bridge toll. Really. What bridge. Anyway, back to the antique faire. My sister Janis and I arrive around 7am and go our separate junking ways. There is so much to choose from. Vendors have their own themes going. Military, garden, fashion, art, imports, advertising, and lots of shabby. It’s always a mystery to me as to what will make me peel out my benjamins that day. My first finds are garden. A heavy iron chair with a floral seat and a white wooden garden table. A little pricey, but charming. I also love these tiny spears that I find out later are for spearing frogs. Useful. 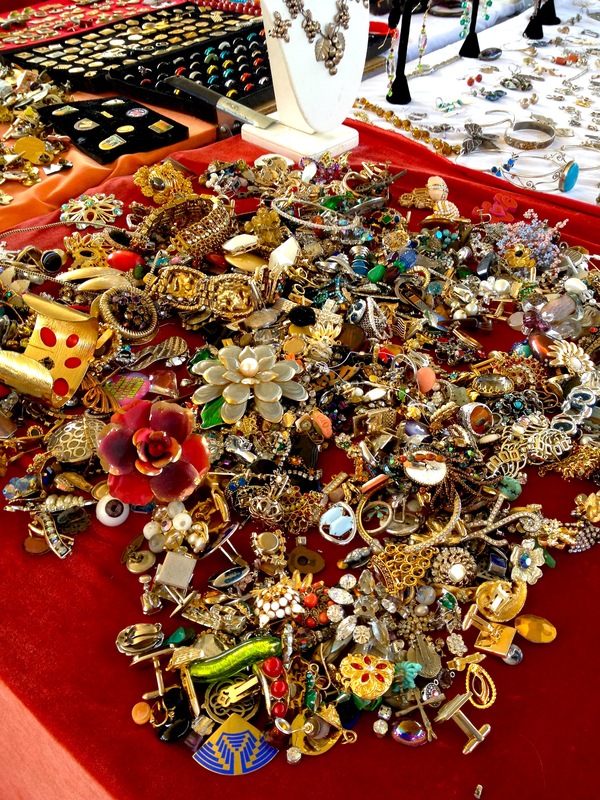 Vendors have tons of jewelry spread out on their tables. I just know there are great finds somewhere in those piles, but am exhausted just thinking about sifting through them, so pass them by. 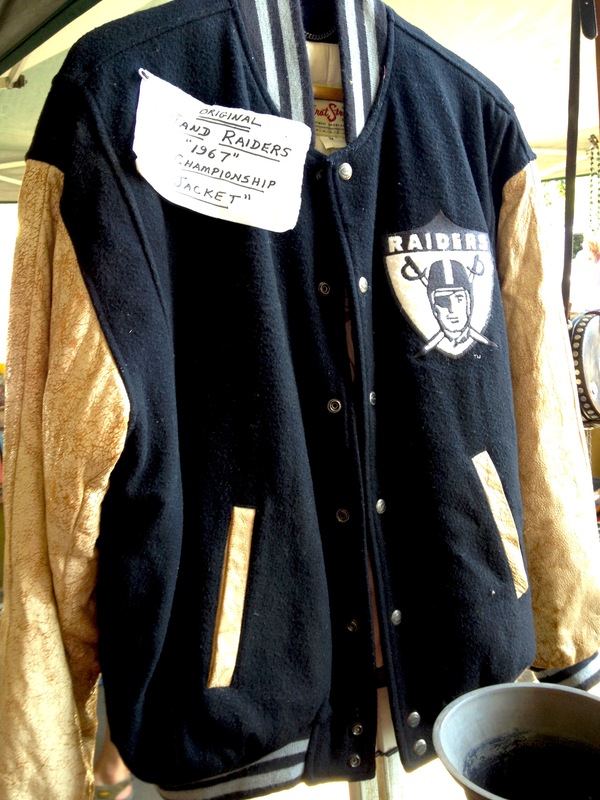 Down the aisle a dealer has a fabulous vintage Raider’s jacket. I really want it, but I overhear him turning everyone down who makes any kind of offer on any of his things, so I just stroke the sleeves and move on. It’s kind of a turn off when a vendor is not negotiable. It’s not Neiman Marcus, it’s a flea market, guys. Part of the fun is bargaining and settling on a price that is good for both the seller and the buyer. I do come upon a really nice couple who have this wicker basket that opens to a fitted English tea set, complete with tin canisters, porcelain cups and silver spoons, with the lid converting into a brass lined tray. They have it priced at $275 and she senses that I love it, so we finally settle on $130. Because of their negotiable nature, I spend another $200 on vintage hats, wooden boxes and men’s collectibles. They also let me leave all my purchases by their truck, which is a great sense of freedom to zoom about the faire with an empty cart once again. After stopping for a cup of coffee, I spot a military dealer. Great army clothes and helmets, but my eye goes to a vintage black leather motorcycle jacket and vest. Before I can even offer a price, this anxious dealer quotes $25 for all. It was a steal. What a find. I am now revitalized and skipping about, open for more sleepers. A tooled leather rifle scabbard is now in my shopping cart, along with motorcycle boots, mirrors and a pink Sunbeam 1940’s mixer. Who am I? As in every shopping expedition, we have our favorite finds. Today my favorites are these old belt buckles, toy guns & holsters and 1950’s Cub Scout manuals. There’s something about that era between 1940-50 that has great graphics, most probably because of the war. Paper was reduced to a lower-grade stock, which actually made the colors and printing on paper, books and boxes, an old dull finish, which I adore. My sister and I find each other, and the fun part is always showing each other what treasures we have bought. My sister loves anything for her garden fences, which she dubs her “wall of shame.” I have no idea what that means. 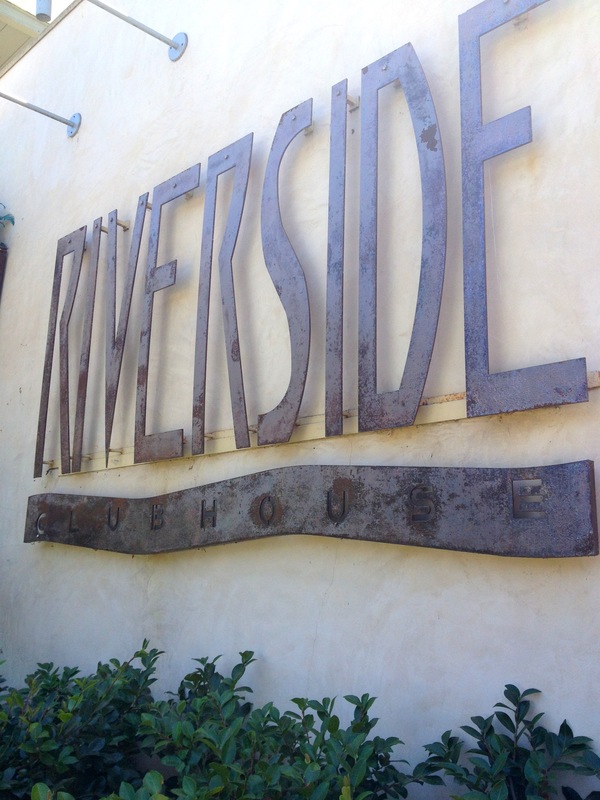 We drive off for lunch to one of the many trendy new eateries that Sacramento has to offer. This historic town is known for it’s trees. Huge leafy shade trees that canopy over the streets among blocks of gingerbread Victorians mixed with brick and concrete lofts. There’s also an exclusive area called Land Park where yard sales abound. Some streets are blocked off for an entire street sale where you can find great stuff at unbelievable prices. Another “not to miss” source of buying, if you love old rags and quilts and blankets, is Thriftown. Aisles and aisles of leather jackets and sections of vintage clothing, with probably the best selection of 1940’s wool blankets and old quilts with jaw-dropping price tags. 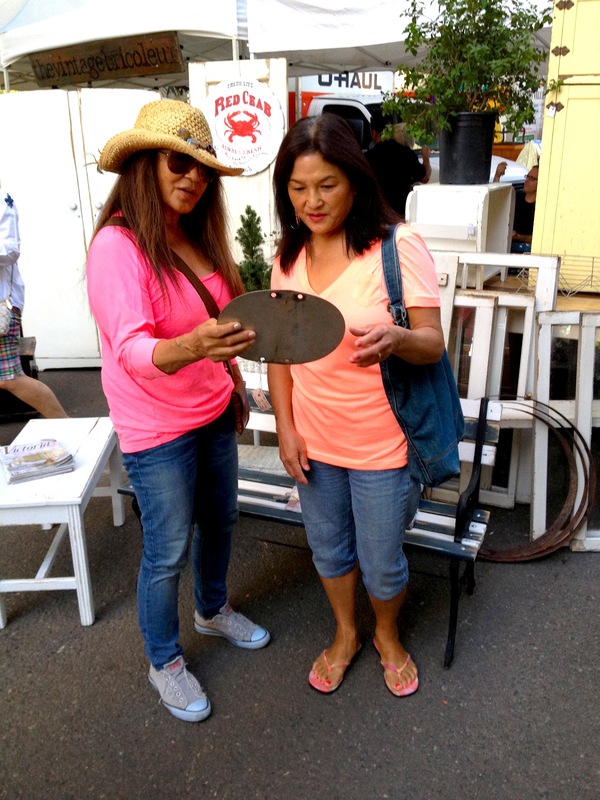 The Under the Freeway Flea Market and all that Sacramento has to offer should be a “must visit” on your junking list. It’s an unpretentious town and offers all the many venues for shopping and eating and enjoying their wonderful trees and beautiful architecture, that will make it all worth while.